Bill Barrett was born in Waco, Texas and was graduated from Texas Tech University with a degree in Animal Science. Kati, a graduate of Sam Houston State University, operates the office for their businesses, and is a freelance writer. Bill Barrett is available for both Santa Gertrudis consulting and sale management. Recognized as an authority on Santa Gertrudis cattle, he is often called upon to conduct seminars and participate in other educational programs both in the U.S. and abroad. He and Kati make their home in Valley Mills, Texas and enjoy their five grandchildren and one great-granddaughter. 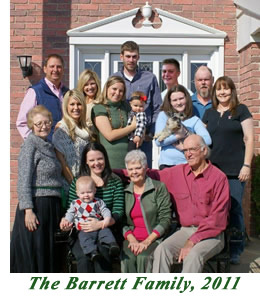 Click here to see Barrett family photos! "When building a future with genetics, whether with trees or cows, sell the worst first. Keep the best for seed. Know the difference by measuring, measuring, measuring!" Click here for more information about Bill Barrett!